Casting carries this film where the narrative is no longer able, especially with minimalist dialogue and a majority of the speeches done through voiceover and through letters. This could have been a detriment to the film were the casting not so spectacularly perfect, but nearly every role helps to elevate each scene beyond the written words. The film follows three individuals involved in a shootout, specifically focused on the aftermath years later. 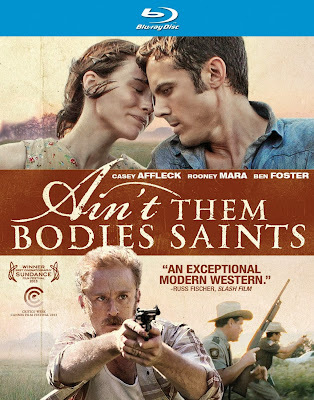 Bob Muldoon (Casey Affleck) is arrested and sent to prison for 25 years after shooting an officer (Ben Foster) during a shootout in the Texas hills in the 1970s, despite the fact that the bullet came from the gun of his pregnant girlfriend, Ruth Guthrie (Rooney Mara). Much of the film takes place about five years after this event. Ruth is raising their young daughter when she hears the news that Bob has escaped from prison. He is on a specific mission to get back to Ruth, though there seem to be an insurmountable number of people determined to stop him. Keith Carradine is particularly wonderful in a father-figure role for Ruth and her child. The only strange inclusion in the storyline is a trio of killers also determined to find Bob, attempting to bring more gunplay into an otherwise quiet film. The Blu-ray release includes a making-of documentary, as well as a behind-the-scenes featurette. There are also deleted scenes and a music video, but none of this is as impressive as the inclusion of Lowery’s first feature, St. Nick (2009). It is also worthwhile to have this movie in high definition, capturing all of the beauty in some of the overdone cinematography.